It is always nice to have some more window handling options in Windows Explorer. Microsoft has added some in the new Windows 7 operating system, but they are still very limited compared to other solutions. The free software Moo0 WindowMenuPlus adds several options to all windows in the operating system. The options become available on a right-click after installation of the program. A right-click on a window title displays all available options, which range from window manipulations to killing processes, freeing up memory or retrieving additional information about the program. Keep on top: Configures the window so that it will remain on top of all other windows. Move To: Move the window to the center, left, right, bottom or top of the computer screen. Maximize To: Maximizes the window vertically, horizontally and to eight other directions. 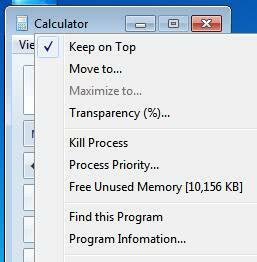 Kill Process: Terminates the process responsible for the window. Deactivated for Explorer windows. Process Priority: Changes the process priority of the underlying process. Free unused memory: Displays excess memory that can be freed. Find this program: Opens the Windows Explorer location of the program in a new window. Program information: Displays various information about the program. Iconize to tray: Moves the window to the system tray, even if that is not supported by default. As you can see, the program offers many options. Some add options only available in Windows 7 to other Microsoft operating systems, while most add new functionality to all systems. Windows Menu Plus is compatible with all Windows operating systems. It can be downloaded from the developer website. The program offers to install a third party program during installation, users should pay attention to the installation process to avoid installing it.